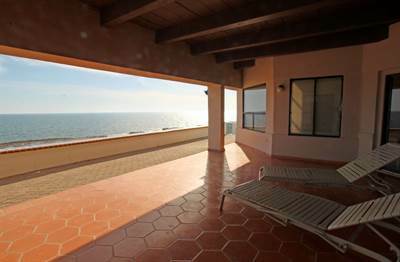 Las Conchas, Puerto Penasco/Rocky Point - Breath taking secluded oceanfront home in popular Las Conchas community by the sea is located close to the entrance, has a separate oversized garage with work bench area, and guest quarters above is now on the market. This is a rare find in Rocky Point. Double door entrance with surrounding palm trees creates a tropical atmosphere. The high beamed ceilings add to the extensive openness and family feeling of this one of a kind property. With custom tile and paint throughout the home is rich in quality. Your gourmet chef will love the exquisite kitchen and cozy adjoining dining area. The master bedroom suite windows give you panoramic ocean views and it has a private door to the expansive covered patio. The two guest bedroom suites are upstairs. A private balcony, window decor and separate lounging room add to the ambiance of your home by the sea. Please call us to set an appointment to tour an oceanfront home you will fall in love with. The unique floor plan offers an exceptional atmosphere for entertaining family and friends. There are two garages, one for 3 cars and one for 2 cars. Posted: Monday, June 17, 2013 4:25 PM by Grant MacKenzie Sr.